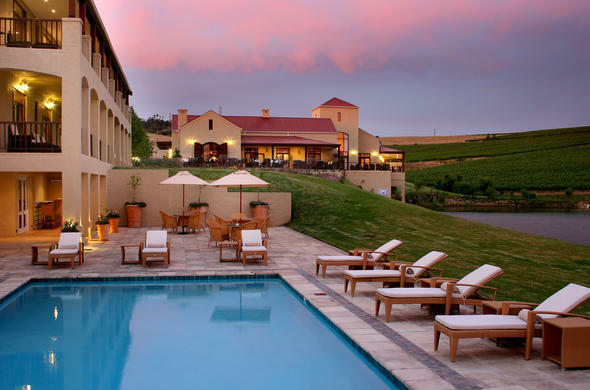 Asara Wine Estate, a three-century old wine estate (Anno 1691), celebrated for its wines, is home to the exclusive 5 star Asara Country Estate Hotel. Calm, Courtesy, Cuisine, Character and Charm. Established in France in 1954, Relais & Chateaux membership includes diverse establishments ranging from castles, abbeys, manor houses, mills, and fine country homes to private hotels and gourmet restaurants.Asara is the brainchild of Markus and Christiane Rahmann who have transformed the wine farm they bought and restored in 2001 with the addition of the modern five-star hotel last year. This unique destination in the winelands, just 20 minutes from Cape Town International Airport, has already built a reputation for warm, relaxed hospitality in luxury accommodation. It also has a Cigar & Whisky Bar, the Sansibar, its own cellar and tasting facilities, as well as a small village-style courtyard, complete with fountain, housing a wine tasting centre and an in-house delicatessen and confectionery.French-Alsatian executive chef, Patrick Bischoff and German-born executive assistant chef, Ulf von Stamm, preside over two restaurants - each offering the choice of indoor comfort or extensive outside dining areas, overlooking the dam and breathtaking mountain scenery. The more rustic Bistro & Tapas@Asara offers informal fare for those wanting to nibble on tasty morsels; sample an array of flavours with their glass of Asara wine, and absorb the glorious surroundings, right on the water's edge. The main restaurant, Raphael's, offers classic European-style cuisine, yet again backed by sensational panoramic views. With its chandeliers, pristine white table linen and brocaded chairs, Raphael's cleverly combines a relaxed, informal ambience, with stylish elegance.With Horst Frehse at the helm, the dedicated team aim to establish Asara as the ultimate Relais & Chateaux winelands destination, living up to its motto of 'out with the ordinary and in with the extraordinary'. With its stylish Grand Ballroom it has already become a favourite venue for weddings and special occasions. Frehse who joined Asara in November has been the delegate of the Southern - East African & Indian Ocean Delegation of Relais & Chateaux since 2004, as well as an internationally elected member of its international board of directors since 2005. He also has had longstanding experience with other luxurious Relais & Chateaux properties, including Paarl's Grande Roche Hotel and Singita Game Reserves in Tanzania and the Kruger National Park.